(A) Shared Parenting Plan. If the parties are seeking shared parenting as defined in O.R.C. 3109.04(J), the plan that the parties are required to submit to the Court shall include provisions covering all factors that are relevant to the care of the children, including, but not limited to, provisions covering factors such as physical living arrangements, child support obligations, provision for the children’s medical and dental care, school placement and parenting time. (B) Procedure. In all cases, the plan shall be submitted as a separate exhibit. If the plan is filed in a dissolution of marriage, the plan shall be filed with the petition for dissolution. In other cases, the plan shall be filed at least 30 days prior to the hearing on the issue of the allocation of parental rights and responsibilities for the care of the children. a. The first and third weekends from Friday night at 7:00 p.m. until Sunday night at 7:00 p.m.
b. The second weekend on Friday from 5:00 p.m. to 9:00 p.m.
c. There shall be no parenting time on the fourth weekend. This four-week cycle shall continue to repeat itself until further order of Court. For a child in grades kindergarten-8th grade, 5:00 p.m. to 8:00 p.m. If there is more than one child, the hour of return shall be the hour for the youngest child. If the parents cannot agree on a day, the day of midweek time is Wednesday. If a child is in a child care arrangement, the non-residential parent may not pick up the child from the caretaker without the prior permission of the residential parent, preferably in writing. 3. Days of Special Meaning. a. Mother’s Day and the mother’s birthday shall always be spent with the mother; Father’s Day and the father’s birthday shall always be spent with the father, regardless of which parent is entitled to the weekend. If the parties cannot agree on times, the time is 10:00 a.m. to 7:00 p.m. Then the child(ren) shall spend the rest of the weekend with the parent who normally has that weekend. b. A child’s birthday shall always be spent with the mother in the even-numbered years, and shall always be spent with the father in the odd-numbered years. The non-residential parent must provide one week’s notice of his/her intent to have parenting time for a birthday. If the parties cannot agree, the time is 10:00 a.m. to 8:00 p.m. for a child not in school on the birthday, and 5:00 p.m. to 8:00 p.m. for a child in school on the birthday. The child’s birthday is to be spent with the designated parent, even if the other parent is entitled to weekend, midweek, holiday or vacation with the child. Brothers and sisters shall attend the birthday event. Easter Father Mother Sunday, 10:00 a.m. to 7:00 p.m.
Should the school age child(ren)’s spring vacation occur in the week after Easter, the Easter parenting time shall extend to Wednesday 7:00 p.m. If spring vacation occurs during another time, the parent having Easter shall have the first three weekdays of the spring vacation. Memorial Day Mother Father Sun. 7:00 p.m. to Mon. 8:00 p.m.
July 4 Father Mother 7/4 9:00 a.m. to 7/5 9:00 a.m.
Labor Day Mother Father Sun. 7:00 p.m. to Mon. 8:00 p.m.
Halloween Father Mother 5:00 p.m. to 8:00 p.m.
Thanksgiving Mother Father Thurs. 9:00 a.m. to Fri. 9:00 a.m.
Christmas Eve Father Mother 12/23 9:00 p.m. to 12/25 10:00 a.m.
Christmas Day Mother Father 12/25 10:00 a.m. to 12/31 5:00 p.m.
New Year’s Eve/Day Father Mother 12/31 5:00 p.m. to 1/1 9:00 p.m.
A holiday that falls on a weekend shall be spent with the parent who is designated to have the child(ren) for that holiday, and the other parent shall have the child(ren) for the rest of the weekend. This time does not have to be made up. a. Six (6) weeks of parenting time each year are to be arranged by the non-residential parent with not less than sixty (60) days advance notice. The non-residential parent’s choice of vacation has priority over the residential parent’s choice, unless the residential parent’s vacation is an annual mandatory shutdown of the place of employment. Likewise, the residential parent must give the other parent not less than sixty (60) days advance notice of vacations or special plans for the child(ren) to avoid planning conflicts. Parents who cannot resolve vacation scheduling conflicts may file a motion in the Court. The residential parent’s time shall not exceed fourteen (14) days without non-residential parent’s parenting time. b. Summer school necessary for a child to pass to the next grade must be attended. Extended parenting time (vacation) may be scheduled by either parent during a mandatory summer school period, but the child must attend all classes. c. Each parent must provide the other parent with destination, times of arrival and departure, and method of travel if the vacation will be outside the parent’s community. d. Vacation parenting time must be exercised in minimum periods of one (1) week, and the non-residential parent has the right to determine whether to exercise vacation in periods of two (2), three (3), four (4), five (5), or six (6) weeks. e. Weekends which normally would be spent with the residential parent, which fall during the non-residential parent’s vacation must be given to the residential parent, or made up at another time. Weekends which normally would be spent with the non-residential parent and that fall during the residential parent’s vacation must be given to the non-residential parent or made up within ninety (90) days. a. Child’s Response to Parenting Time. If a child indicates strong opposition to being with the other parent, it is the responsibility of each parent to appropriately deal with the situation, by calmly talking to the child as to the child’s reasons, and to work with the other parent to do what is in the child’s best interests, and particularly to avoid confrontation or unpleasant scenes. If the matter is not settled, either parent should seek the immediate assistance of a mental health professional or file a motion. As uncomfortable as this issue may be for a parent, this issue should not go unresolved. It is the absolute affirmative duty of the residential parent to make certain that his or her child goes for the parenting time period. b. Exercise of Parenting Time. This schedule presumes that the non-residential parent shall be there promptly for all the parenting times and days for weekends, midweek, days of special meaning, and holidays, and that no advance notice to the residential parent is necessary. The residential parent shall have the child(ren) ready. c. Cancellation of Parenting Time by Non-Residential Parent. The non-residential parent must give notice of intent not to have parenting time, not less than twenty-four (24) hours in advance, unless a last minute emergency occurs. A parent who does not exercise parenting time forfeits the time. A parent who continually fails to keep his or her commitment to parenting time may have rights of parenting time modified, and may be subject to other legal remedies as well, upon motion by the residential parent. d. Keeping the Children Together. This schedule presumes that if the parents have more than one (1) child, the parenting time will be exercised with all children together. e. Returning the Child(ren) After Exercising Parenting Time. This schedule presumes that the non-residential parent will not return the child(ren) prior to the end of the parenting time period stated (not early, not on a different day), unless the parties agree in advance, and that the residential parent or the responsible adult well-known to the child(ren) will be present when the child(ren) is/are returned. This schedule presumes that each parent will be prompt for pickup and return of the child(ren), that the residential parent will ready the child(ren) emotionally and physically for parenting time. The residential parent has no duty to wait for the non-residential parent to pick up the child(ren) longer than thirty (30) minutes, unless the non-residential parent notifies the residential parent that (s)he will be late, and the residential parent agrees to remain available after the thirty (30) minute waiting period. A parent who is more than thirty (30) minutes late loses the parenting time period. A parent who has a pattern of lateness for pickup and/or return is subject to penalties under the law. The non-residential parent has responsibility for picking up and returning the child(ren). The non-residential parent, if unavailable for the pickup or delivery of the child(ren), must use an adult well-known to the child(ren) for this purpose. All child restraint laws must be complied with by any person driving the child(ren). No person transporting the child(ren) may be under the influence of drugs or alcohol. Only licensed drivers may transport the child(ren). The residential parent is responsible for providing sufficient appropriate clean clothing for every parenting time period, based on the lifestyle of the residential parent and child. If the planned parenting time activities require special or unusual clothing needs, the non-residential parent must notify the residential parent at least two (2) days in advance of the parenting time period. If the child does not have the type of clothing requested, the residential parent is under no obligation to comply with the request. All clothing sent by the residential parent must be returned immediately after the parenting time period. A parent must provide time for any child to study, complete homework assignments, papers, or other school assigned projects, even if the completion of this work interferes with the parent’s plans with the child(ren). If schoolwork is assigned by the school prior to parenting time, the residential parent must inform the other parent of the work to be done, and it must be completed during parenting time. j. Address and Telephone Numbers. Each parent must, unless the Court orders otherwise, keep the other informed of his or her current address and telephone number, and an alternate telephone number in the event of an emergency. k. Illness or Injury of a Child. If a child becomes ill or injured, warranting the giving of medication or consultation with a doctor or dentist, each parent must notify the other parent as soon as possible. If the child becomes ill while with the residential parent prior to a scheduled parenting time period, the parent must contact the other parent and discuss the advisability of whether the parenting time period should take place with the best interests of the child as the primary consideration. Parents should consider the nature of the illness (whether it may be contagious, or the child is physically uncomfortable, etc. ), the care necessary, the ability to provide the care, exposure of the illness to others, plans, and any other important issue. If the parents agree that the child should go for parenting time, then the residential parent must provide written instructions and sufficient medication to last during parenting time to the other parent. The non-residential parent must care for the child as directed, notifying the other parent if the child’s condition worsens, or does not improve as might reasonably be expected. If the parents cannot agree that the child should go for parenting time, then the non-residential parent has the right to additional time with the child for not more than one (1) hour at the time scheduled for parenting time to begin. This does not apply if the order of any Court or consent agreement prohibits the non-residential parent from being at the home. If another child is scheduled to have parenting time, then the regular time must go on with that child. If parenting time is canceled due to the child’s illness or injury, then the time must be made up within sixty (60) days to the non-residential parent at a time of his or her choice. If the child becomes ill or injured during parenting time warranting the use of medication or medical or dental consultation, the non-residential parent must secure appropriate emergency treatment. No schedule can adequately spell out what should be common sense when dealing with an ill or injured child. The existence of any allergy or chronic condition suffered by a child must be communicated in writing from the residential parent to the non-residential parent, including medication or treatment recommended for the illness or condition. If a child often misses parenting time due to illness or injury, then a non-residential parent may require the child to be examined by the child’s usual physician. The examination shall be at the expense of the non-residential parent. The examination of the child may be in the presence of the non-residential parent, subject to the discretion of the treating physician. If the residential parent refuses to schedule a medical appointment as requested, the non-residential parent may file a motion. Scheduled periods of parenting time shall not be delayed or denied because a child has other scheduled activities (with friends, work, lessons, sports, etc.). It is the responsibility of the parents to discuss activities important to the child in advance, including time, dates, and transportation needs, so that the child is not deprived of activities and maintaining friends. The parent who has the child during the time of scheduled activities is responsible for transportation, attendance and/or other arrangements. If the activities are regularly scheduled, they should be agreed upon in advance and written into the judgment entry or decree. Both parents are encouraged to attend all their child(ren)’s activities. Each parent has the right to talk over the telephone with the child(ren) as often as the parents agree. If the parents do not agree, then the non-residential parent should not normally have telephone privileges more than twice per week. In addition, a parent may call a child when on vacation with the other parent as the parties can agree; if no agreement, then the residential parent has telephone privileges twice per week if the vacation period takes place at the other parent’s home. Telephone calls should be during the normal hours a child is awake and if the child is unavailable for conversation, each parent shall take the responsibility of seeing that the child timely returns the call. A child is permitted to call a parent. This schedule presumes that the parents are available for parenting time purposes for full weekends and midweek times. If the non-residential parent is regularly employed every weekend or chooses not to exercise parenting time on the weekend, the parents should agree in advance about the day and time for parenting time. If the parties cannot agree, either may file a motion. o. Non-Compliance With Court Order. Any of the responsibilities or rights outlined in this schedule may be enforced by the court upon the filing of the appropriate motion by either party. A parent may not withhold the rights of parenting time because the other parent does not obey a court order, for instance, to pay support, or medical bills, etc. Penalties for willful denial of parenting time include jail sentence and/or change of custody. 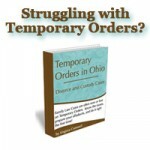 A parent may seek enforcement of periodic child or spousal support order by calling the Cuyahoga Support Enforcement Agency. p. The Court reserves the right to modify the parenting time order upon the motion by either party. If the residential parent intends to move to a residence other than the one specified in the current Court order, he/she must file a notice of intent to relocate with the Court that issued the order. The order must state either that the parent with parenting time rights is or is not to be given a copy of the notice, depending on the determination made by the Court pursuant to O.R.C. 3109.051(G). 8. Access to Records, Day Care, Student Activities. Pursuant to O.R.C. §3109.051 (H), (I) and (J), the non-residential parent is entitled to access under the same terms and conditions under which access is provided to the residential parent to any record related to the child(ren), any student activity related to the child(ren), or any day care that is, or in the future may be, attended by the child(ren). If the non-residential parent is not to have access under the same terms and conditions, the order must specify the terms and conditions that apply to the non-residential parent. in regards to the non custodial parent. Where can I find specified date in which my ( non custodial) weekend began? i currently have shared parenting with my ex. she has residential custody and i am going to be relocating out of state. what would i possibly be awarded for visitation? i was told it is 6 weeks in the summer and every other spring and christmas break. is this true? I am wondering how the court views overnight visitation with children from birth to 4 years old. What are the guidelines?